I LOVE making maps. Whenever I played adventure games as a kid (or, let’s face it, as an adult) I often made meticulous maps of how each area led to the next. Any time I really want to understand something, I have to write everything out and make a map to connect things together – usually after I’ve gotten myself lost a few times. Since organic chemistry is also journey where a lot of students get lost along the way, I thought it might be helpful to “map out” the course for my students so that they know how the different pieces fit together. If I was an illustrator I would draw a beautiful map like XKCD. Lacking that talent, I just use my illustration software of choice (ChemDraw) and built a pyramid. From my experience in seeing hundreds of different courses, I’ve made a map of what a “typical” Org 1 course looks like and how each chapter builds on the one before. There is lots of variation, of course, but about half the courses follow the “standard sequence” which I’ll elaborate below (very textbook dependent – McMurry in particular likes to cover alkenes late). Yours is probably different in some way – but the way in which concepts build up is still the same. I welcome you to share your experiences and opinions in the comments! One comes into organic chemistry from an introductory course in general chemistry. Starting out, it’s assumed you have a basic knowledge of chemical bonding, the octet rule, VSEPR (geometry), equilibria, acids and bases, thermodynamics and so on. Concepts build from this base. I’ve made a few completely arbitrary “levels” to describe how concepts progress from there. The general idea is that every level depends on concepts from the levels below it. I wouldn’t take these “levels” too seriously, but they might be helpful to group together certain concepts and see how they build on each other. Level 1 – Bonding and Geometry. The first week or two of organic chemistry goes over the key concepts of bonding from general chemistry, and introduces hybridization, bonding (sigma and pi), dipoles, molecular geometry, molecular orbitals, and other notions like condensed formulae. In other words, we show how atoms bond together to form small molecules like NH3, H2O, CH4, and so on. Level 2 – With the Level 1 concepts under our belt, we can now start to think about electron density and electron flow. We can describe functional groups, examine their dipoles (unequal sharing of electrons) and learn about the intermolecular forces responsible for physical properties like boiling points. We also learn about resonance (delocalization of electrons), and introduce the use of curved arrows to show electron flow. We can also use the tool of curved arrows to show simple chemical reactions such as acid-base reactions, and our lessons on electron flow help us understand the factors that influence acidity. Level 3 – Building on “Level 1” concepts like bonding and geometry, we can start to examine slightly larger molecules, and start with the simplest “functional group” (if you want to call it that) – alkanes. Importantly, line diagrams are introduced to show the structure of alkanes, and we learn about structural isomers, the energies of different molecular shapes (conformations) and the properties of cycloalkanes. Reactions are generally limited to free-radical halogenation of alkanes (alkyl halides are important for substitution/elimination in Level 5). The structure, bonding and geometry of alkenes (but not their reactions) is often covered at this point as well. These (arbitrary) levels 2 and 3 are actually pretty interchangeable in terms of the order in which they’re covered. I chose to put “electron flow” on the bottom because the conformations/cycloalkanes/alkanes chapters flow naturally into stereochemistry – “geometric isomers” (e.g. cis/trans isomers in cycloalkanes and alkenes) being the prime example. Level 4– Now comes the chapter on stereochemistry, which is, in my opinion, the key theme of Org 1, since so many of the reactions learned in subsequent chapters will use the concepts introduced here. Here, the consequences of the three-dimensional nature of organic molecules are first demonstrated, and we learn about stereoisomers. Seeing molecules in 3 dimensions from their depiction on a 2-dimensional page is a struggle for many introductory students. If you start struggling here – as many do – get help now, because if you wait, it might be too late. Level 5 – Three key classes of reactions are covered at this level – reactions of alkenes, nucleophilic substitution, and elimination. The order in which these topics are covered varies considerably from course to course. This is really the “wax on”, “wax off” moment – where you’ll be asked to put together all the concepts you’ve learned previously and apply them! This is also where many students start to really struggle! ALL the concepts in the previous levels will be applied here. It’s the point where you finally start to stitch together the somewhat disconnected previous chapters into a coherent whole. To take a specific example, truly mastering the chapter on nucleophilic substitution reactions will require that you be able to apply an understanding of stereochemistry, conformations, cycloalkanes, resonance, curved arrows, and acids/bases to various types of problems, in addition to the bedrock material on chemical bonding. There are a lot of reactions presented in rapid sequence and it’s very easy to fall behind. This is about 6 weeks into the course, a time where you will likely have many other obligations (midterms in other courses, lab reports, etc). So this is the real squeeze point. All of these combine to provide a “perfect storm” that leads many to drop the course at this point. Level 6 – More reactions. Alkynes are covered after alkenes, and many important reactions of alcohols are of the substitution/elimination variety. There are two common sequences – alkene->alkyne then substitution/elim, or substitution/elim then alkene->alkyne. Alkynes are a “blank canvas” – they can be transformed into essentially any functional group we choose. Once reactions of alkynes are covered, you’ll start to notice you’ll get an increasing number of synthesis questions. Synthesis is the art of planning how to build a target molecule from “starting materials” using a sequence of reactions, and success will require you to master ALL of the skills you gain in levels 1-5, most importantly a knowledge of the reactions and their stereochemistry. Alcohols are a wild card. The chapter on alcohols contains many substitution and elimination reactions, and furthermore includes reactions of epoxides (generally built from alkenes). 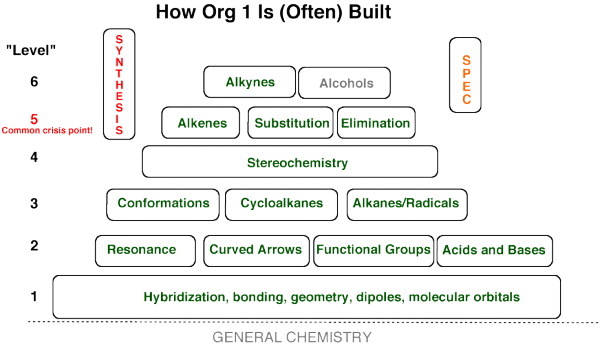 Because Org 1 covers so much ground, alcohols are often pushed back to Org 2, but they really belong in Org 1. Another wild card is Spectroscopy – the main tool we use to determine the structures of molecules. This needs to get covered somewhere, so it’s usually shoved near the end of Org 1 or the beginning of Org 2. Alternatively some instructors stagger it out through the courses of Org 1 and Org 2. Lots of variation on this point. For those who’ve taken the course (or teach it), how close does this follow your own experience? Leave a comment! I’ve reorganized the first couple chapters (which I agree are rather disjointed) to try to tell two coherent stories. First we ask and answer How do Organic Chemists Draw and Depict Molecules? We start with hybridization and bonding, drawing conventions, and resonance, then go straight into Newman, Fischer projections, chair conformations, and interconverting between the like. Then we switch focus and ask and answer How do Organic Chemists Name and Describe molecules. We start with functional groups and stereochemistry, then pretty much all semester 1 nomenclature all at once all mixed together. Finishing up with words to describe individual molecules or the relationship between molecules. That takes us up to mid-semester. Second half of the semester is substitution/elimination of all kinds, then electrophilic addition of all kinds, with synthesis heavily stressed throughout. Spec waits til the first unit of sem2 for us. I rather appreciate the reorganization of the first two units around those common questions. It tells a better story, it makes sense in terms of building on what we’ve just seen to do something new. No more ‘remember in chapter 1 when I said we’d pick up on this later…’ to clear up the disjointedness. Thanks Adam. It’s always great to hear how you look at teaching the course. Great diagram, James! I love it! This should have been your first post, nonetheless it is great. Hello James: I am an Analytical chemist (PH.D in 1968). However I have a daughter that needs to be tutored by me in Organic chemistry. Basically I hated Organic chemistry and I avoided like the plague. So my minor was Physical Chemistry. Taking Orgo 1 at USF. Level 1 was skipped for us under the assumption you learned it in gen chem. So, our level 1 was like level 2 + nomenclature. Spectroscopy was included to some degree with the level 3 material which is otherwise pretty spot on. Level 4. My minor struggles began with stereo-chemistry, but not enough to make me drop the course (I still had an A, albeit a low one). Level 6 does include alcohols, ethers, epoxides, and grignards for us- and that’s a lot! Wish me luck because I’m on level 6 now. I’m using your site like crazy! I have not yet taken this course but I am glad that I stumbled upon your site. You make it very clear what is expected of us as students to succeed in this course which is something I cannot say to many of the professors that I have come into contact with throughout my college experience! Thank you for taking the time to put this together I really appreciate it. Is this really all of Organic 1? Your entire pyramid is what is covered on my first test, and it’s week 5! Oh dear. That’s a fast moving course!